Originally built in 1860, Exchange Hall offers the perfect venue for your wedding ceremony or reception. Our Ballroom features seven-foot tall windows that allow the room to fill with natural light from floor to ceiling. Have your first dance with your significant other on our beautiful dance floor as your family and friends look on. Our Ballroom can hold up to 140 people and we’re happy to recommend vendors if you’re in need of a caterer, DJ, florist and or other vendor service. Our elegant Victorian Room is perfect for a small ceremony, cocktail hour, or simply a quite space to chat when music and dancing fill Ballroom. This space is great if you’re looking for a smaller setting for a bridal shower or groom’s dinner. It can hold up to 40 guests, making it the perfect spot for an intimate gathering. 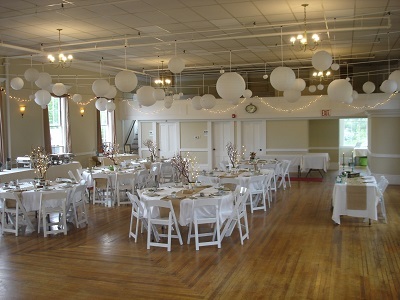 For those interested in holding their wedding ceremony or reception at Exchange Hall, contact us today. If you have any questions or would like to view the hall please call us at 978-263-8500 or fill out our online contact form.